So one of the biggest developments in underground/lyrical hip-hop was the winter signing of Slaughterhouse to Shady Records. One of the back stories to the entire deal was the reconciliation of Eminem and Royce da 5'9. Though their beef had been squashed years before it took some conversations and 'manning up' over the past 18 months or so to bring this entire deal about. So its a good thing, and while we await a new studio album with major backing from the slaughterhouse quartet, it seems that Marshall and Royce were feeling the mood so much that they hit the studio to record a short album. 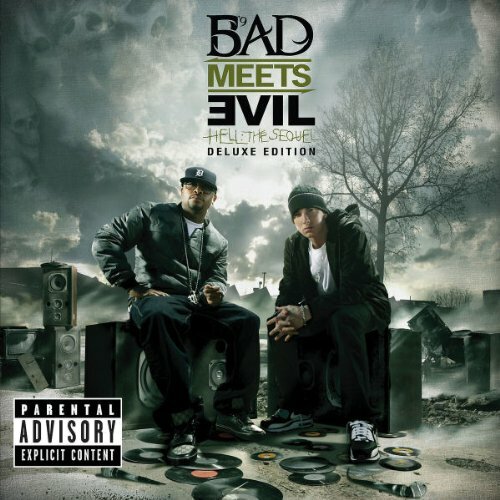 The album starts with "Welcome to Hell" a rapid fire re-introduction to what you can expect from a Royce and Eminem collaboration. A dark beat with a quick tempo and a lot of complex metaphors and similes used to describe one or two things in a verse. If you have the patience and listen multiple times you will enjoy an album that is gonna give you new things with each listen. "FastLane" is a slightly slower song for the duo and is the first single with a catchy half-hook while the duo goes back and forth on the second half of the song with some serious bars. "A Kiss" has a mean beat but the lyrics can be hard to follow, the gist of it is about how the two would like to choose to treat groupies. "Lighters" features Bruno Mars and is the most introspective song on the record as Bad Meets Evil chronicles the paths they have traveled, especially Royce. The entire Slaughterhouse clan is on "Loud Noises" which does sound like that,a lot of noise with some seriously rapid fire verses, highlighted by Joe Budden and Crooked I(after his first 4 bars or so). The subject of music piracy is discussed on "Take From Me" where Em feels let down and disappointed by fans who want more constantly then just go and download an album illegally. "Above the Law" is alright, not really about anything and Royce's verse are slightly better because they are easier to hear and understand. Meanwhile "I'm on Everything" samples a Mike Epps comedy routine for the chorus which gives it that oddness one would expect from an Eminem album. Now there are two bonus tracks on the deluxe edition (why they didn't just put them on the 'regular' version is beyond me but I'm pretty sure everyone will have these two extra songs). "Living Proof" is hot, not really about much but Em addresses some of the things people complain about him, that he talks about women too much and doesn't have much depth. The same thing is with "Echo", album filler in a way. Overall, people who like the old ridiculous slim shady might be satiated by this album because he does go back to his roots. Like I said before there are a lot of lyrics to catch but the biggest issue is that all of the songs are at this tempo, and both Royce and Em seem to be yelling. Mixed in with the loudness and harshess of most of the tracks, it becomes somewhat distracting. Casual fans probably won't be buying this at all but it is a decent offering for the market it is targeted to.